One of the four Privates in Captain Varnum’s B Troop that was killed at Wounded Knee was Ralph Cook, a twenty-three-year-old teamster from Chicago. Cook had been with B Troop for over two years. As with most of the casualties in B and K Troops, Cook was likely killed during the initial volley or subsequent clash as the Miniconjou men broke through the lines of the two cavalry troops surrounding the Indian circle. According to the “Death Roll” published in the Omaha Bee on New Years Day, 1891, Cook was shot through the heart. Captain Varnum merely listed him as killed in action on the troop’s muster roll and on Cook’s final statement and provided no detail of the soldier’s death. Final statement of Private Ralph Cook as reported by Captain Varnum on 31 December 1890 at the Pine Ridge Agency. Ralph L. Cook was born in May 1867, the second son of John and Kate Cook. John Cook was originally from Maine and married in the early 1860s Kate J. Plumstead, the teenage-daughter of John and Sarah (Reed) Plumstead from New York. Their eldest son, James, was born in 1866, Ralph a year later, and Charles Mortimer was born in 1869, all three in Philadelphia, Pennsylvania. John and Kate relocated their family to New Jersey in the early 1870s where they had three additional children: Edna born in 1872, Mildred in 1874, and Francis in 1877. John’s pursuit of employment next took the family to Buffalo, New York, where he worked in a ship yard. While there Kate delivered another son, Frederick, born in 1879. Finally, John and Kate settled in Chicago, Illinois in the early 1880s where Kate had two more girls: Mable born in 1882 and Orie in 1885. As a young man, Ralph Cook worked in Chicago as a teamster, which in the 1880s was a worker that hauled cargo in a wagon pulled by an eight or ten-horse team. At the age of twenty-one he enlisted in the Army for five years in August 1888 and was assigned to Captain Thomas M. McDougall’s B Troop, 7th Cavalry, although that officer was on sick leave for over a year and Lieutenant Gresham was commanding the troop. According to his enlistment record, Cook stood five feet six inches tall, had brown eyes, black hair, and a dark complexion. Following his death at Wounded Knee, Private Cook, like most of his comrades killed that day, was initially buried in the Episcopal cemetery at the Pine Ridge Agency two days after the battle. His body was moved in October 1906 and reburied in the Fort Riley Post Cemetery. 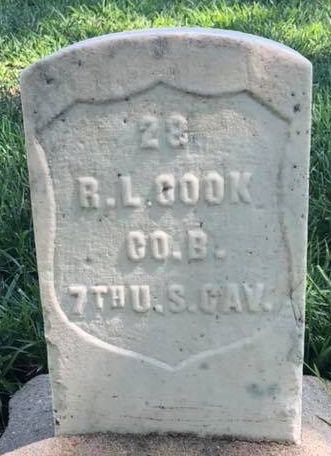 Private Ralph L. Cook is buried in the Fort Riley Post Cemetery. As with most enlisted soldiers, Private Cook was not married. His mother, who at the time of his death was a widow, filed for a pension in February 1891. She was still living on her son’s pension in Chicago in 1900 with her three adult children, James, Edna, and Mildred, and raising her two teenage-daughters, Mable and Orie. Mrs. Kate Cook later moved to Bremerton, Washington, where she lived with her son, Charles, and his wife, Mary. Kate Plumstead Cook died on 23 October 1920 at the age of 74 at Bremerton. Omaha daily Bee., January 01, 1891, Part One, Image 1,http://chroniclingamerica.loc.gov/lccn/sn99021999/1891-01-01/ed-1/seq-1/ accessed 4 Nov 2013. Adjutant General’s Office, Final Statements, 1862-1899 at Fold3, http://www.fold3.com/image/1/271303407/ accessed 7 Dec 2013. 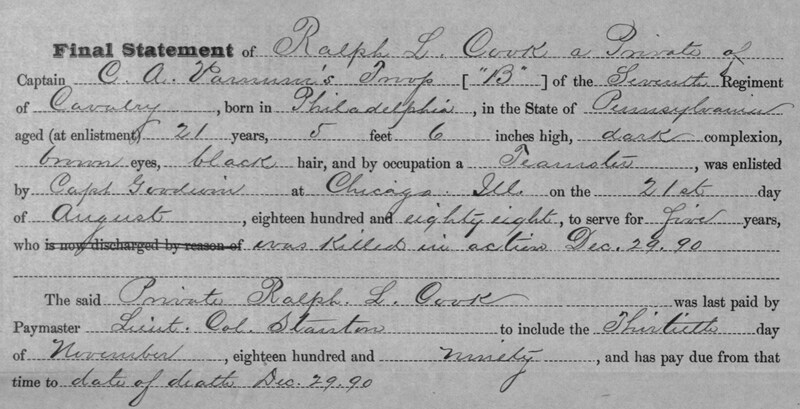 Ancestry.com, United States Federal Census [database on-line], Provo, UT, USA: Ancestry.com Operations, Inc., 2009, Year: 1870, Census Place: Philadelphia Ward 26 Dist 84 (2nd Enum), Philadelphia, Pennsylvania, Roll: M593_1441, Page: 57B, Image: 118, Family History Library Film: 552940; Year: 1880, Census Place: Buffalo, Erie, New York, Roll: 831; Family History Film: 1254831, Page: 27A, Enumeration District: 159, Image: 0056; Year: 1900, Census Place: Chicago Ward 26, Cook, Illinois, Roll: 277, Page: 4A, Enumeration District: 0805, FHL microfilm: 1240277. Ancestry.com, U.S. Military Burial Registers, 1768-1921 [database on-line], Provo, UT, USA: Ancestry.com Operations Inc, 2007, Original data: Burial Registers for Military Posts, Camps, and Stations, 1768-1921, Microfilm Publication M2014, 1 roll, ARC ID: 4478153, Records of the Office of the Quartermaster General, Record Group 92, National Archives in Washington, D.C.; National Archives and Records Administration, U.S., Civil War Pension Index: General Index to Pension Files, 1861-1934 [database on-line], Provo, UT, USA: Ancestry.com Operations Inc, 2000, Original data: General Index to Pension Files, 1861-1934. Washington, D.C.: National Archives and Records Administration, T288, 546 rolls; Archive Number: 44778151, Series: A1 627, Record Group Title: Records of the Office of the Quartermaster General, 1774-1985, Record Group Number: 92. Samuel L. Russell, photo., taken 25 Aug 2018. Ancestry.com, United States Federal Census, Year: 1900, Census Place: Chicago Ward 26, Cook, Illinois, Roll: 277, Page: 4A, Enumeration District: 0805, FHL microfilm: 1240277; Year: 1920, Census Place: Bremerton Ward 5, Kitsap, Washington; Roll: T625_1931, Page: 4B, Enumeration District: 53, Image: 843; Ancestry.com, Washington, Deaths, 1883-1960 [database on-line], Provo, UT, USA: Ancestry.com Operations Inc, 2008, Original data: Various county death registers, Microfilm, Washington State Archives, Olympia, Washington. This entry was posted in Casualties, Enlisted and tagged 1890, 7th Cavalry, 7th Cavalry Regiment (United States), Big Foot, Cavalry, Fort Riley, Killed in Action, Lakota, Miniconjou, Oglala Lakota, Pine Ridge, Pine Ridge Agency, Pine Ridge Indian Reservation, Wounded Knee, Wounded Knee Creek, Wounded Knee Massacre. Bookmark the permalink.